October is a busy month in Chicago, and although fall brings colder weather, it also brings festive events, special attractions, outdoor adventures, and great food to this huge Illinois city. 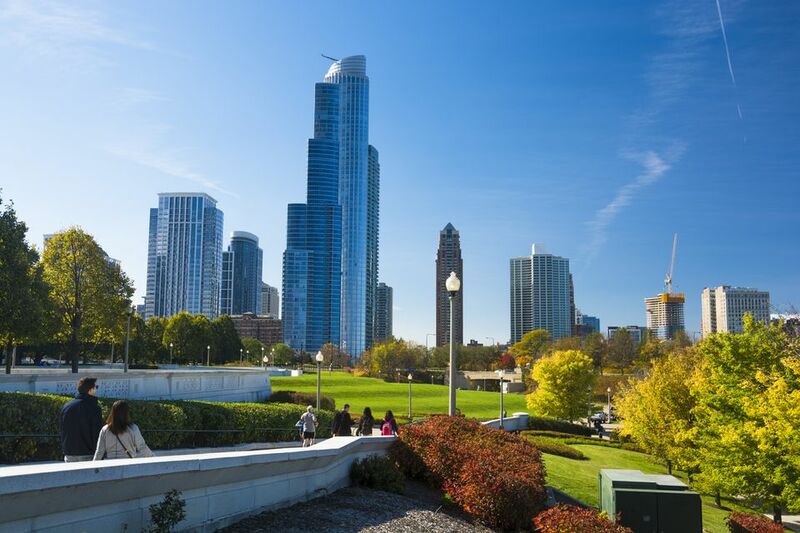 Whether you want to spend the days outdoors exploring the city or inside one of the many restaurants and shopping centers Chicago has to offer, October is a great month to experience the Windy City. Plus, with events like the Chicago Marathon, the Columbus Day Parade, and Halloween happening in October, you'll find plenty of one-of-a-kind celebrations to enjoy during your visit. The weather in Chicago ranges from an average high of 63 F (17 C) to an average low of 44 F (7 C), but the temperature from day to day can vary significantly. If you're visiting the windy city this month, pack layers of clothing and a light windbreaker to protect against the temperamental fall weather. More often than not, the weather in October is warm enough for alfresco dining and drinking at Chicago's many indoor-outdoor restaurants and bars as well as exploring the great outdoors on one of the city's many walking and biking food tours. Hotel prices are reasonable throughout the month, except during the Chicago Marathon on the weekend of October 7, 2018, and you can generally expect fewer crowds and lines at the city's top tourist attractions. If you're in the mood to update your wardrobe, this is also a great time of year to catch sales at some of Chicago's shopping malls. However, the weather can also be unpredictable in October, and snowstorms and strong winds do sometimes delay flights into and out of the city during the month. If you get stranded at one of the airports, you can always check out one of the airport restaurants and bars, but expect them to be pretty crowded. Also, since so many events happen over the weekends, hotel prices and crowd sizes fluctuate throughout the month. This is especially true during the marathon, which attracts participants from all over the world, so hotels are booked solid and streets are blocked in major neighborhoods. On top of being National Pizza Month, which Chicago restaurants celebrate by offering discount prices on the classic Chicago deep dish pizzas, October is also the month of Halloween, Columbus Day, and the Chicago Marathon. Celebrations in the city kick off on October 7, 2018, with the Chicago Marathon, which brings tourists from around the world to the city. The next day is Columbus Day, which brings the Columbus Day Parade to downtown Chicago. Starting the following weekend and running through most of the month, the Chicago International Film Festival also draws a huge crowd to the city. Dates for this year's festival run October 11 through 25 in 2018, but you can also catch the Chicago International Television Festival from March 20 to 22, 2018. Since Halloween falls on a Wednesday this year, most celebrations will take place on the weekend before, though some will take place in early November. If you're looking for something to get you in the Halloween spirit any time of the month, visiting haunted venues in Chicago are sure to be a thrill, or you can also check out the Halloween celebration at the Brookfield Zoo.